Stark Excavating is one of the Midwest’s busiest construction firms, with revenues of $100+ million annually and a fleet of over 200 pieces of equipment valued at more than $30 million, write Jeff Jackson, Concrete Production Manager at Stark Excavating and Gregg Pickering, Silo Supervisor at Martin Engineering. The company’s broad expertise extends from earthwork, sewers, foundations and pile driving to bridge construction, flatwork, curbing and demolition. Stark currently operates four offices, three concrete batch plants and three sand/gravel quarries in Central Illinois. To help feed its sizable project flow, the firm’s Commercial Acres Ready-Mix Plant in Normal produces an average of 60,000 cubic yards of concrete each year, with approximately 65% used in private and commercial construction, including walls, flatwork, footings and parking areas. Around 25% goes to public and DOT sector projects, such as parking structures and bridge construction, with the remaining 10% to outside sales. Commercial Acres features a Treyco RMC Plant that’s capable of producing more than 200 cubic yards per hour. The complex includes three 125-tonne storage silos measuring 30’ × 30’ × 57’, two used for cement storage and one for fly ash/pozzolan storage. The facility also has an aggregate bunker with four 25- tonne truck dump hoppers that transfer material via conveyor into four 150-tonne, climate-controlled aggregate storage silos. Cementitious material is hauled to the plant in pneumatic tankers and blown into the silos through 3-inch lines. Over time, material dust in the three pneumatically-loaded silos began building up, first on walls and ridges and eventually clinging to all the interior surfaces. As a result, the air flow became constricted, raising the pressure within the silos and exerting greater force on the structure, connections and piping. The compacted build-up continued to collect particles, effectively shrinking the internal space as the pneumatic blower forced more material through the silos. The severity of the problem became apparent to system operators when they noticed the walls of the silos actually starting to bulge outward. During a shutdown and inspection, the staff could observe gradual interior damage and decided that over-pressurization had compromised the structural integrity of the three storage vessels. The need for repairs was clear and immediate, but the material build-up presented a serious obstacle. 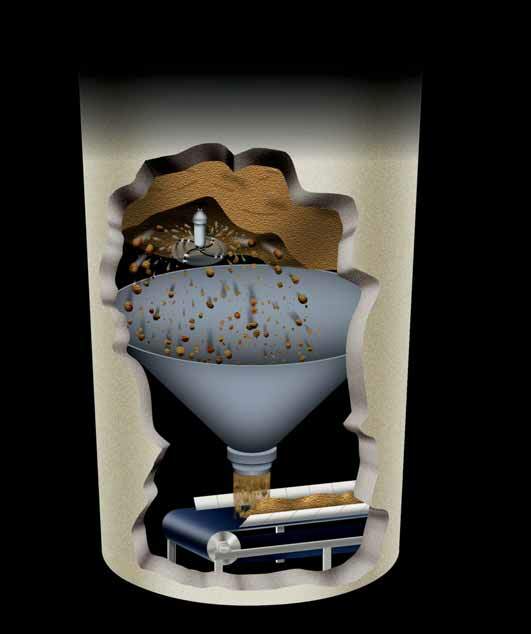 While investigating possible solutions online, operations personnel located a recent article in an industry publication on the subject of silo cleaning, authored by Martin Engineering (Neponset, IL). Already familiar with the company from using its conveyor belt cleaners and other components, Stark researchers sent an email inquiry, briefly explaining the problem and the urgency of a resolution. They received a phone response the same day, and a Martin Engineering Field Supervisor scheduled a site visit for Saturday, during which he visually assessed the situation. A two-man crew arrived on Monday morning to begin work. It was determined that the best approach was to employ the Martin® Heavy Duty Whip, one of several technologies that make up the company’s Silo Solutions product line. The Martin Heavy Duty Whip is a portable, remote-controlled tool that can be lowered into storage containers through a manhole opening. Powered by compressed air, the patented gyro motor can use a variety of different flails and cutting edges to knock down accumulated material without damaging storage vessels. Abrasion-resistant steel chain is best suited for most applications, with non-sparking brass chain for combustible materials. Urethane flails can also be employed to protect lined vessels that could be susceptible to damage from metal tools. Martin’s top-access cleaning technology eliminates the need to send a man inside a storage vessel and risk potential injury. The equipment is set up outside the silo, and it’s portable enough to manoeuvre around various bin sizes and shapes. The modular boom of the Whip extends up to 28 feet (8.5 metres) and can clean vessels up to 60 feet across (18 metres) from a central opening of just 18 inches (450mm) in diameter. Air hose is protected with double wire braid, and the pneumatic motor delivers powerful cleaning action from the rotating head to remove buildup. Part of the success of the Whip is its straightforward, air-driven design. Competing systems that run on hydraulics tend to be heavy and cumbersome. They also present the possibility of a fluid leak, which could damage otherwise-salvageable material. The pneumatic whip requires no hydraulics; it needs just 100 CFM at 90 PSI, which can usually be supplied from a plant’s existing compressed air system. In locations where compressed air is not available, a portable compressor can be brought to the site. The technicians secured the equipment through an access hatch at the top of each vessel at Commercial Acres. Though all Martin silo cleaning crews are OSHA and MSHA certified for confined space entry, they instead used remote control from outside the bin to safely guide the cleaning head. The two-man crew lowered the whip through an opening in the blockage, starting at the bottom and undercutting the material as they worked their way up. In most cases, the technique allows material to be recaptured and returned to the material stream, and Stark was able to salvage the entire 40 tonnes of cementitious product removed from the silo. The entire process was completed in just ten working hours, with all three storage vessels cleaned out and ready to schedule repairs after just a one-day outage for the service. The silo restoration will include removing all internal horizontal supports, pulling all sidewalls back to their original flat position, then replacing the horizontal bracing and adding further dimensional support. Exit feedback from Stark management was a clear indication of the company’s satisfaction with Martin Silo Services, which helped the facility quickly resolve a difficult issue and prepare for the required repairs as soon as possible. The report showed work was completed in a safe and timely manner, precisely on the predicted schedule. Stark Excavating was formed with the creation of a modest excavating company by Lyle Stark in 1946. With a third generation of family members now managing the firm, it’s grown to include 400 employees, four office locations, three quarries and two RMC plants. All material extracted and/or produced at the various Stark Materials facilities is subject to quality testing to confirm the grading accuracy in each of its plants and quarries, allowing the company to sell the products as certified materials under the guidelines established by the Illinois Department of Transportation. Martin Engineering supplies conveyor products and flow aids around the world in a wide variety of bulk handling applications, including cement/clinker, rock/aggregate, coal, biomass, grain and other materials. Founded in 1944, Martin Engineering is the world leader in making bulk materials handling cleaner, safer and more productive. The firm is headquartered in Neponset, IL (USA), offering manufacturing, sales and service from factory- owned business units in Brazil, China, France, Germany, Indonesia, Mexico, South Africa,Turkey, India, the UK, Japan, Russia, Peru and under exclusive licence with ESS Australia.